Home » Collection » Gary Snyder, Peter Orlovsky, Allen Ginsberg on wall overlooking Himalayan range vista, Kausani 1962. Joanne Kyger snapped the photo in my camera, the four of us making Buddhist tour of India stopped to visit Lama Anagarika Govinda. 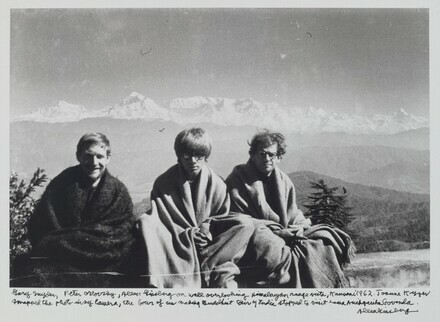 Gary Snyder, Peter Orlovsky, Allen Ginsberg on wall overlooking Himalayan range vista, Kausani 1962. Joanne Kyger snapped the photo in my camera, the four of us making Buddhist tour of India stopped to visit Lama Anagarika Govinda. Gary and Ellen Davis, Greenwich, CT; gift to NGA, 2012.